The play-offs remain eight points away from Mansfield Town with just six games to go which now looks a bridge too far for Adam Murray’s men. So the club have targeted 60 points to at least try to end the season in their best League position for 12 years – they currently have 53. 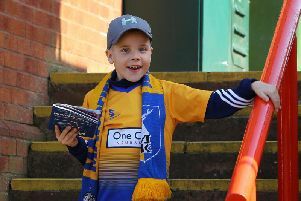 Seven games without a win has been Mansfield’s downfall at exactly the wrong time of season, their latest defeat a 2-1 loss at Hartlepool United last weekend. They would dearly love to end that run on Saturday as well as finally chalk up a win over a top 12 side for the first time all season with United in eighth, a point off the play-off spots. Like Mansfield, ex-Stags boss Keith Curle also saw his side suffer a ‘March of Doom’ though they did manage one win from the seven games at home to rivals Bristol Rovers. And they will be all fired up from wining their Battle of the North 1-0 at home to Hartlepool United on Tuesday night. Apart from Curle, there are other former Stags at Brunton Park in the shape of Michael Raynes and Derek Asamoah. Adam Murray welcomes back two players from suspension but loses another two to suspension and injury at the same time. Back into the squad come midfield general Jamie McGuire after a one-game ban and striker Adi Yussuf after that eye-popping five game suspension for urinating in public at Plymouth. However, powerful centre half Krystian Pearce begins a three game ban for his third red card of the season and influential midfielder Chris Clements is out with a hamstring injury that looks to have ended his season. Murray had options but hinted he may also introduce one or two youngsters from the club’s successful youth set-up. Shearer, Alfei, Tafazolli, Collins, Benning; McGuire; Rose, Thomas, Daniel; Dieseruvwe, Green. Regular started, striker Charlie Wyke, missed out on the midweek win over Hartlepool and fans will be awaiting news of why and if he will be fit for Saturday. The Cumbrians have been missing right back Alex McQueen and striker Steven Rigg, both with groin strains. McQueen is said to be very close to a return and Rigg not too far off either. So both may figure on Saturday, though both are squad players and not front line regulars anyway. Recent signing, winger Louis Pedro, has been out the squad for a couple of games as they carefully build up his fitness and get him up to speed for League Two action. So he could also figure against the Stags. The 25-year-old Angola-born wide-man has spent much of his career in the Dutch league with teams such as Feyenoord and Heracles, plus stints in Bulgaria and Romania. Gillespie, Miller, Raynes, Ellis, Gillesphey, Gilliead, Kennedy, Comley, Grainger, Ibehre, Stacey. Ryan Tafazolli, in talks about a new deal with Stags, will need to keep an eye on Jabo Ibehre if he starts the game as he did in midweek. A talisman for the club before Christmas, he still leads the Carlisle line well when he plays, though his goals have dried up. However, he has never been a prolific scorer through his career and the scoring spell was quite a departure for what he had done before. His season was rocked by a couple of injuries and he is still getting back up to speed, but you always know what you’ve got with Ibehre. Ibehre is a target man, but not just a big lump up front. He is mobile, likes to turn players and likes to run the channels. He bagged Carlisle’s leveller at Mansfield on the opening day of the season. Danny Grainger is the club’s influential captain, playing at left back or left of midfield. He is a local lad and a great leader and ambassador for the club, underlined by how he took the players out to help local people clear the flood water from their homes at the turn of the year. A very good crosser of the ball, Grainger struggled a bit last season but has kicked on this season to become a key man for them. A familiar figure to Stags fans, boss Keith Curle has dragged Carlisle United out of the rut they were in and given the club fresh impetus. Last season he managed to steer them to safety and has now put them into the play-off reckoning. Along the way he has certainly created some turbulence, upset a few people and shaken the place up. But, at the same time, he has certainly improved things on and off the field, bringing a new level of professionalism to Brunton Park. He often keeps people guessing and likes trying unusual things too. But the club needed a fresh pair of eyes and to try something different after slumping into that rut. So even though Curle is not everyone’s cup of tea and not every supporter is his biggest fan, he does command respect and has done the club a tremendous job so far. He is fondly remembered at Mansfield for getting the side to the play-off final against Huddersfield and also for the shabby way his stint as boss ended, winning a wrongful dismissal case against the club after being accused of bullying a youth team player. Awarding undisclosed damages in 2006, a judge cleared Curle of any wrongdoing on Friday saying that Mansfield’s disciplinary process was a “sham”. Carlisle’s season has been a pretty good one so far. After two or three years of misery it’s been the first season when the club have been looking up rather than over their shoulders. They have had a few ups and downs along the way due to a bit of inconsistency, but to be just one point off the play-offs with six games to go shows a significant improvement in their fortunes. They have also enjoyed a couple of good cup runs, including games with Liverpool and Everton, and all this while having to deal with being homeless for a couple of months due to the flooding in the area that submerged the ground. In general the team is now in better shape than it has been for a while and hoping to round off the season with a bit more drama. Mansfield came out fighting in the second half but failed to find the same dominance in possession and creativity, especially in wide areas, as they had enjoyed in the first half. Chris Clements twice went close with shots over the bar, before Matt Green fired a shot agonisingly wide in second half stoppage time as Mansfield were left settling for a point. Brunton Park is the largest football stadium in England which is not all-seated, with a capacity around the 18,000 mark. The ground opened in 1909. Brunton Park’s grandstand burned down in 1953 and the stadium flooded completely in 2005 and again last year. Brunton Park is split into four separate stands; Warwick Road End, East Stand, Main (West) Stand and the Petteril End, which remains closed unless exceptionally large crowds are in attendance. In 2010 Brunton Park was used during the production of the BBC television programme United, a docudrama centring on Manchester United at the time of the Munich air disaster. The ground was chosen due to a likeness in parts of the stadium with 1950s Old Trafford. To drive to Brunton Park (Warwick Road, Carlisle, CA1 1LL) take the M6 to junction 43 and head west down the A69 till you see Brunton Park on your right. There is an official car park behind the ground and an unofficial one on the right before you get there. Parking restrictions have been tightened in recent years and much of the street parking in the area is now residents only. Tickets purchased on the day of the game will be subject to a £3 increase, apart from junior and child tickets, which will remain the same price. Stags have received a small allocation of tickets for wheelchair spaces, which can be purchased from the Mansfield Town ticket office. Tickets will be on sale until 4pm this Friday. Visit the Stags’ ticket office on Quarry Lane, or call 01623 482482. Keep in touch with all things Mansfield Town 24/7 via our new Mansfield Town Live Scribble feed.